I need to spend more time checking out company blogs and design team calls. 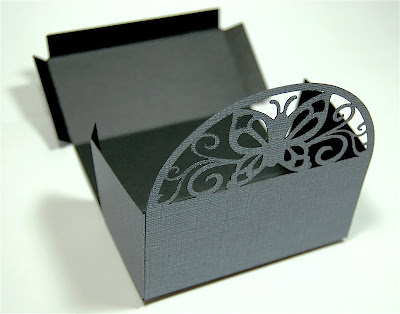 I just realized that today is the deadline for a Design Team call at Core'dinations - one of my favorite cardstock choices. We are driving to New Jersey today so I did not have a chance to make a lot of new projects. 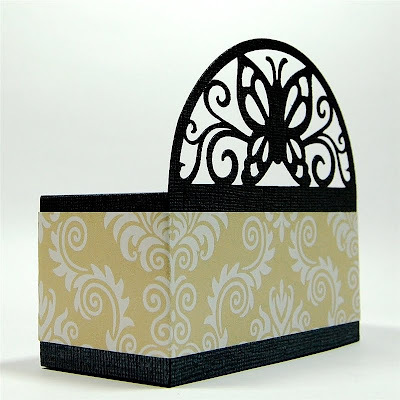 I thought it couldn't hurt to try by posting some of my favorite projects that I have done using Core'dinations cardstock. I particularly like the "gemstone" and "core couture" lines. To enter the Design Team Call I need to post three projects in one post and title it "My Core'dinations Creative Frenzy." I have copied ans pasted in three of my favorite projects. You may have seen these before but sometimes it is fun to take a second look. This will be a very long post since it is three combined to one and my posts are usually very detailed and long! 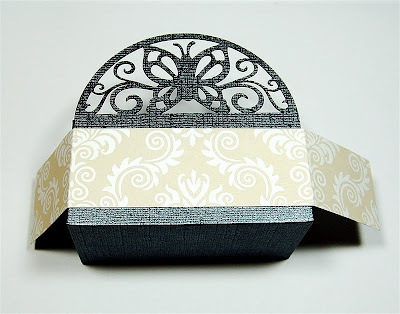 I designed these wedding table items when I was on the Cuttlebug Challenge Design Team - they are still one of my favorite projects! I created a menu card and matching favor box & place card holder using Design Studio and the Straight From the Nest cartridge. 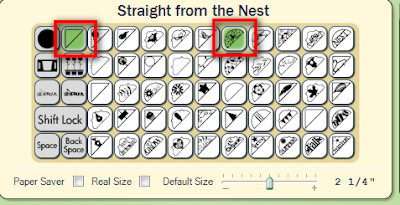 The centerpiece of both designs is this "corner" from the Straight From the Nest cartridge. I turned it to use the flat side to weld with a rectangle for both of my projects. 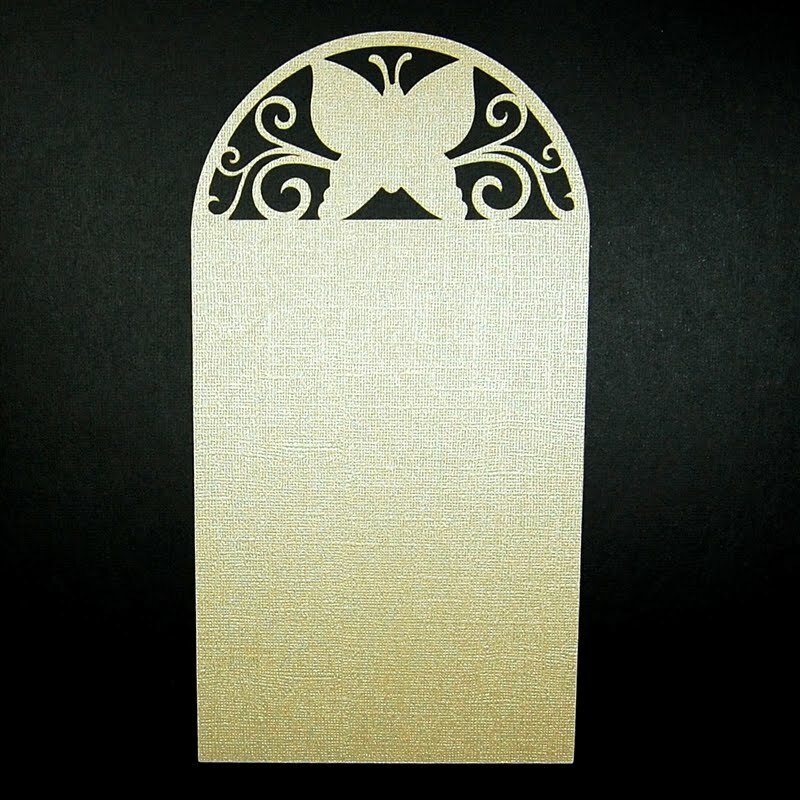 This is the menu card base cut from Core'dinations gemstone cardstock. I used "hide selected contour" to black out the butterfly image for the base. This screen shot shows the hidden lines. 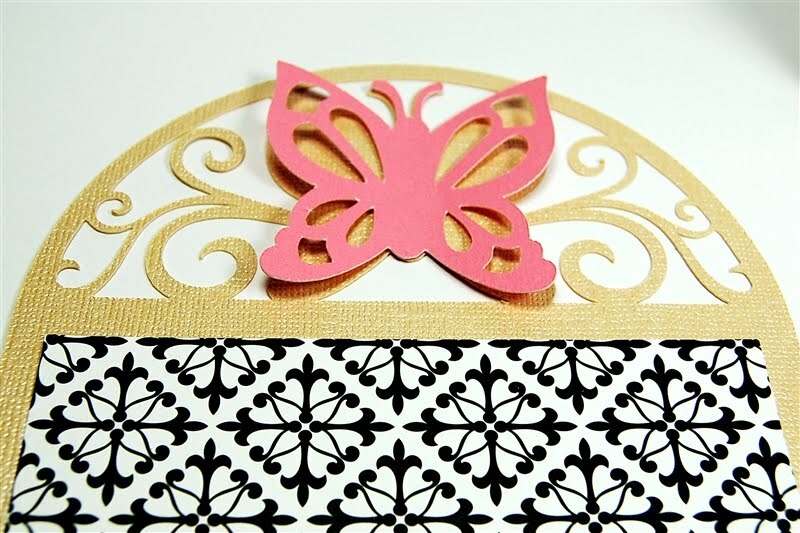 I wanted to layer butterflies with the lace cuts on the base, however, the butterfly images that are coordinating to this cut do not have that option - so I had to get a bit creative. I chose the base butterfly from the cartridge. 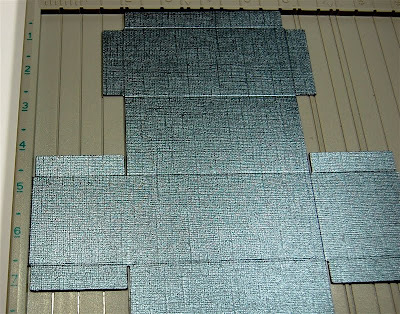 It has a lot of detail or webbing lines to help with the placement of additional layers. In order to eliminate these lines, I simply checked weld in the Shape Properties Box. 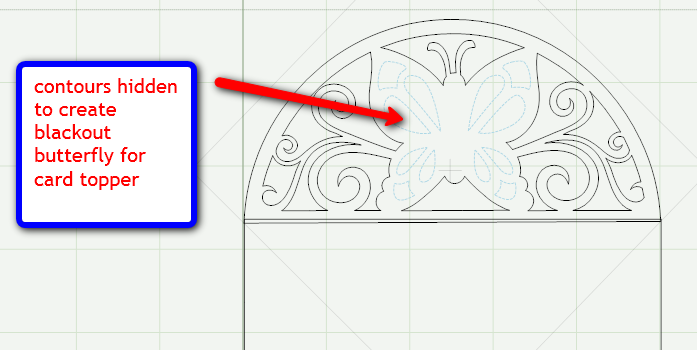 Then I sized another copy of the corner arch to fit the butterfly and hid all of the lines except the cut outs I wanted to produce inside the butterfly. 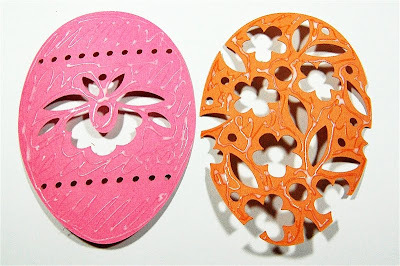 I aligned the two images and cut one butterfly in black and one in pink. 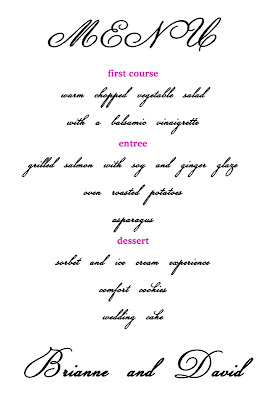 The base of the menu card is 5 x 7 inches. 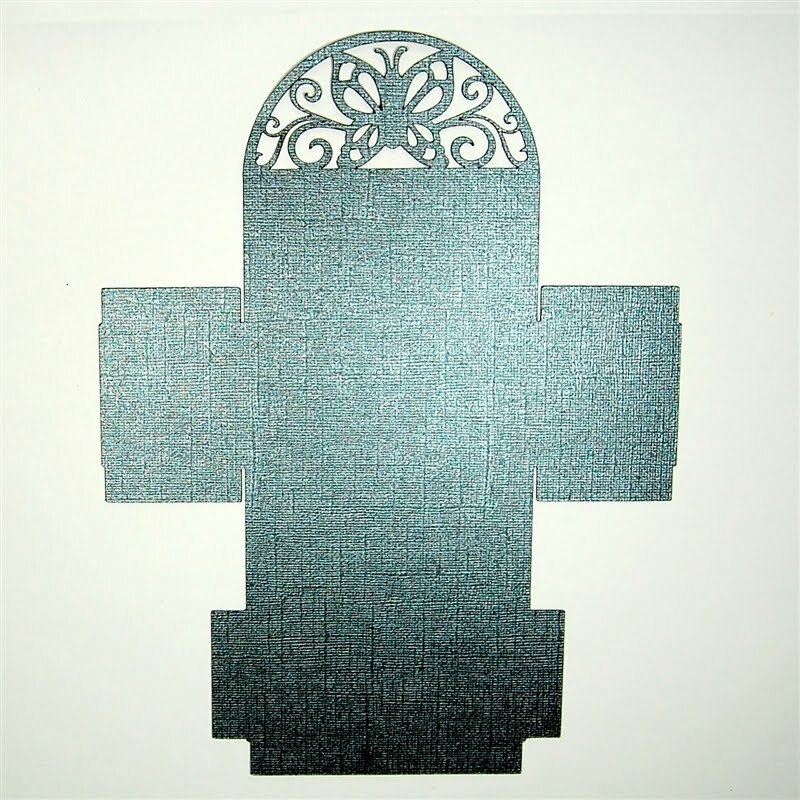 I cut a piece of the Teresa Collins paper we are featuring in these projects to 4 1/2 x 6 1/2 inches to make a mat for the menu. I adhered the pink butterfly layer in the center, leaving the wings free to bend up a bit. 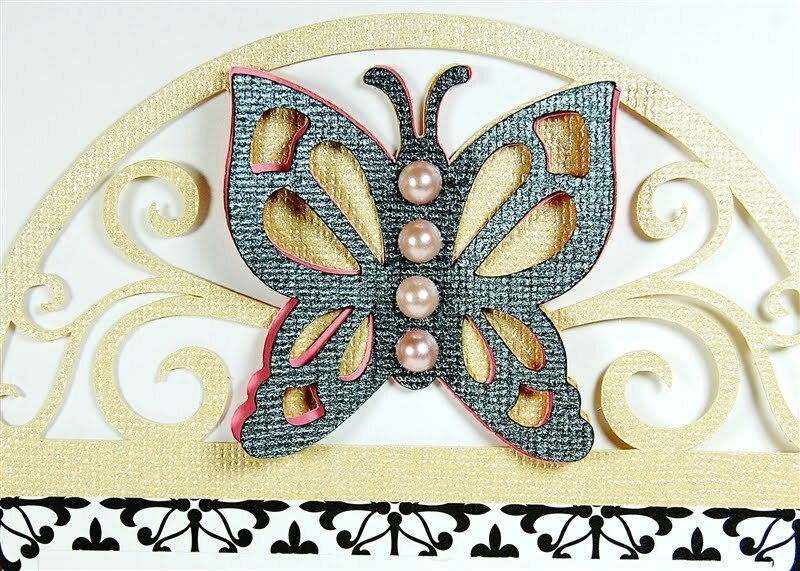 I added the black layer on top and used some pink pearls to accent the body of the butterfly. The actual menu was set up as a 4 x 6 photo in my Creative Memories StoryBook Creator Plus 3.0 software. The fonts we used are Champignon for the script and Charis SIL for the block letters. 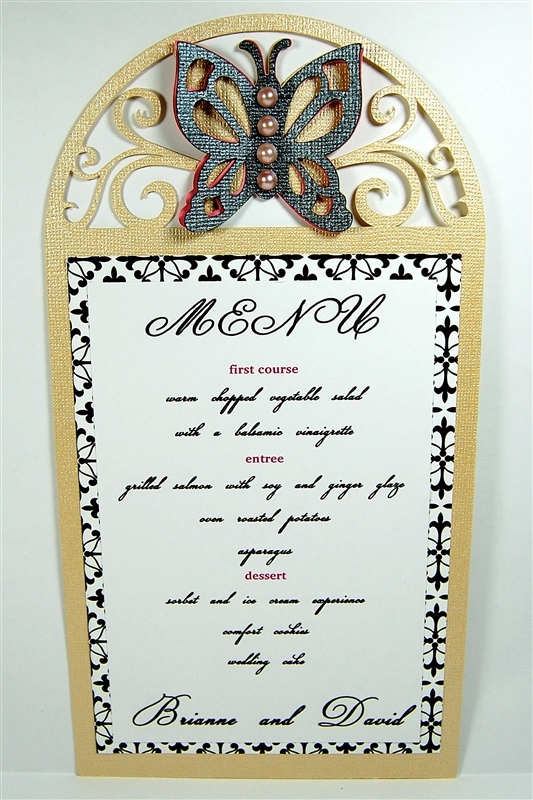 A menu card can be placed on the table for each guest and may be saved as a memento of the day (possibly ending up in a scrapbook!). 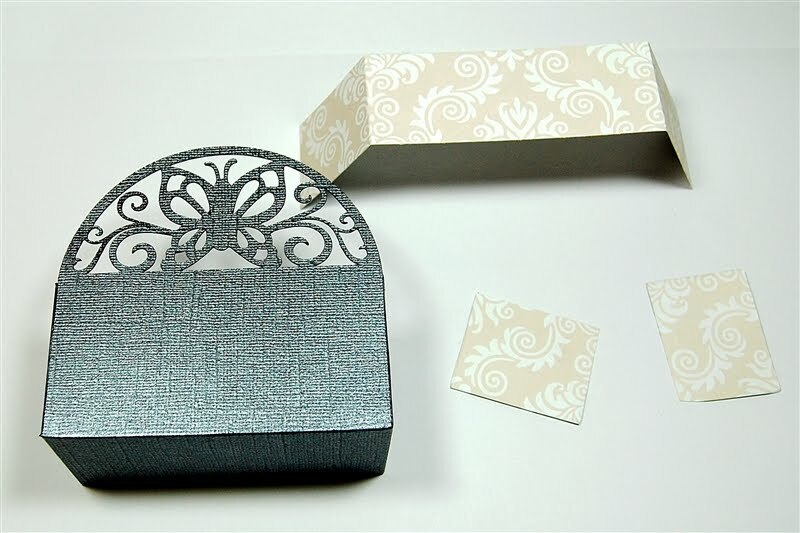 The favor box/place card is four inches x 2 inches x 2 inches which makes a nice size for adding candy inside. The names of the guests could be printed on matching cardstock and attached to the flat lids. 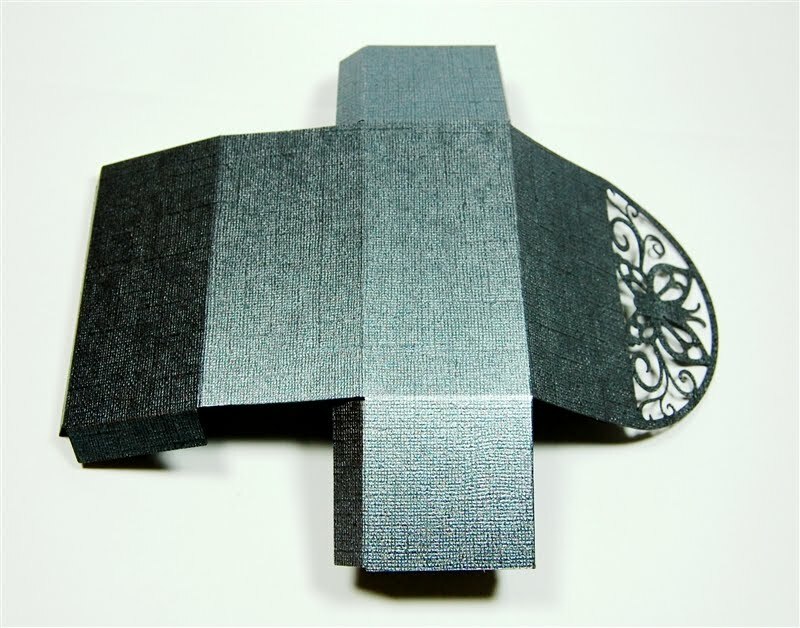 The box was cut from the black gemstone Core'dinations cardstock. To make sure I have a clean cut for intricate items like this topper, I usually do a multi cut of 2 times. 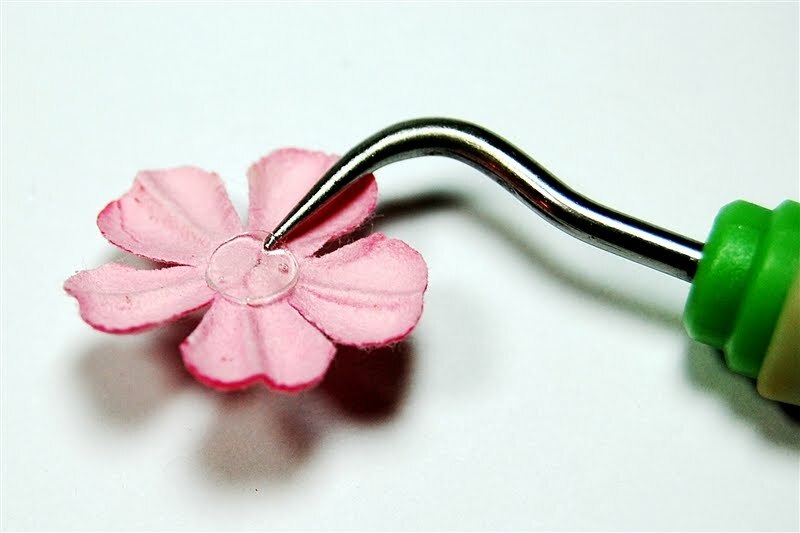 This solves the snags that sometimes occur in tight corners and small sizes. The box is scored at the 1/2 inch, 2 1/2 inch, 4 1/2 inch and 6 1/2 inch marks. Then the box is turned and scored for the sides at the 2 and 6 inch marks. After scoring all of the folds are made toward the "mountain" side of the score mark. I wanted the shiny side to be the outside of the box so I scored with it on the top. The inside is a matte black. 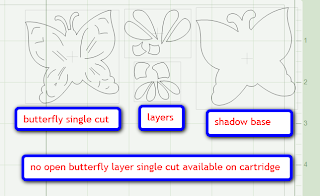 The back of the butterfly cut will show this side. Use a strong adhesive for the side flaps and first adhere the box front making sure that your corners are square. The folded box is very plain (except for the cut-out design) so it needs some embellishing! I cut a 1 1/2 inch strip of another Teresa Collins paper (this is from the "Mr. and Mrs." collection). 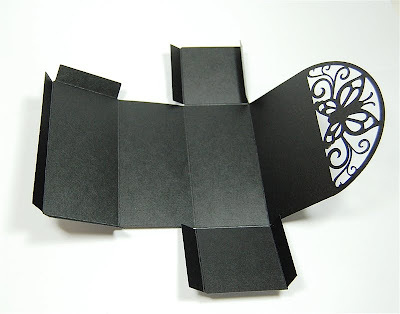 I made sure that the design was centered, creased the paper with my fingers at the corners and then trimmed the ends that extended beyond the sides of the box. 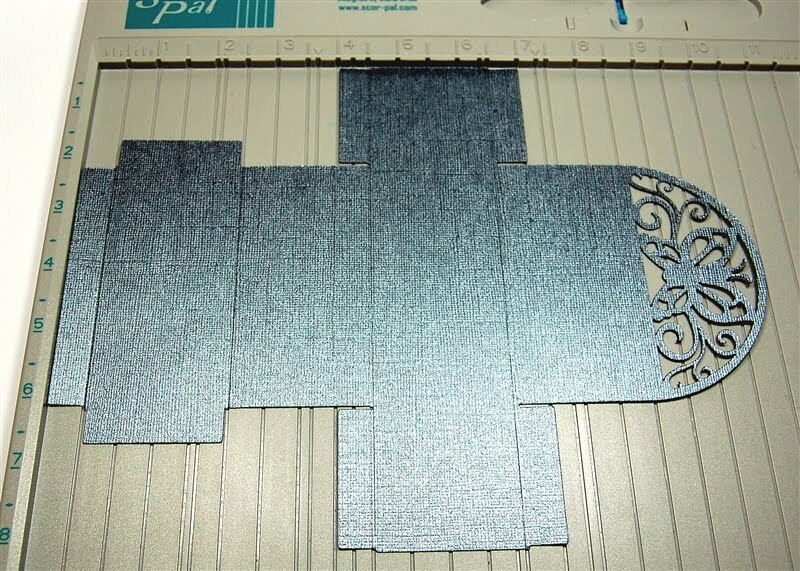 Here are the pieces ready to assemble (I'll use the two stub ends for another project). 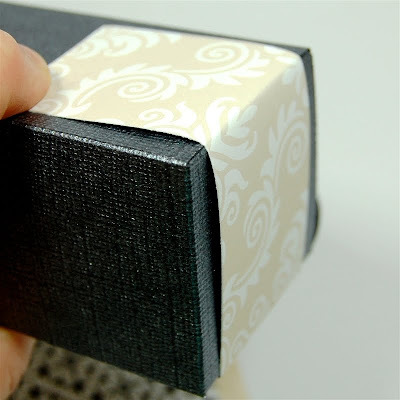 The adhesive is applied to each section separately to make it easier to get a smooth wrap around the corners of he the box. Next I added some ribbon to tie around the entire box. I cut a piece at 24 inches and that was just about the perfect length. The ribbon is tied in a simple bow at the back of the box. I added some pearls in two sizes to the butterfly body and wings. 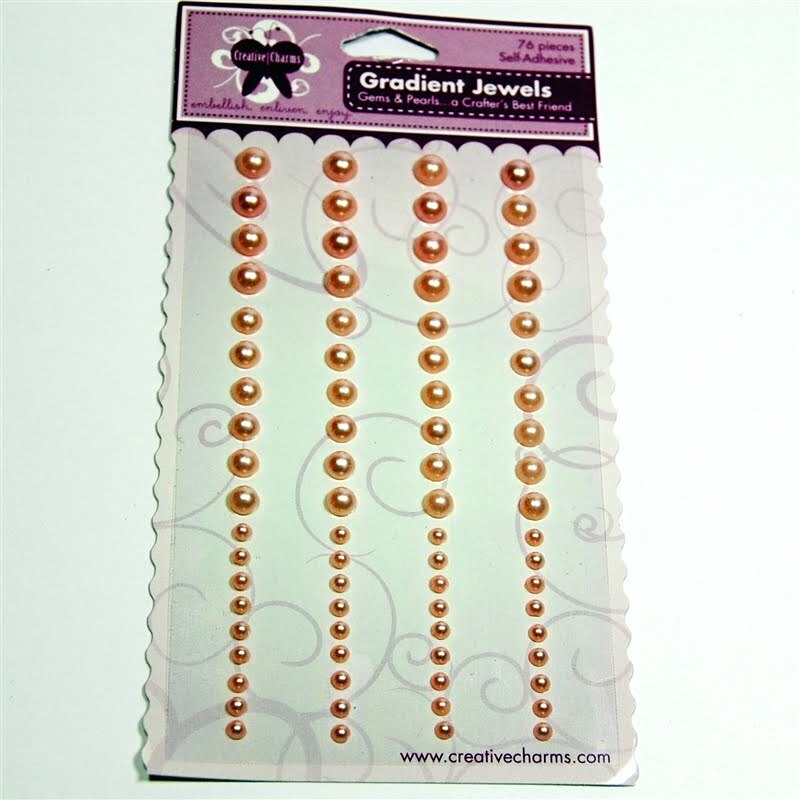 The pearls are from Creative Charms and come in three sizes. 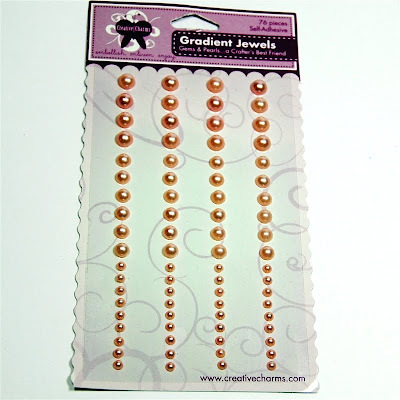 Here is a LINK to the page on their site where you can see these pearls. 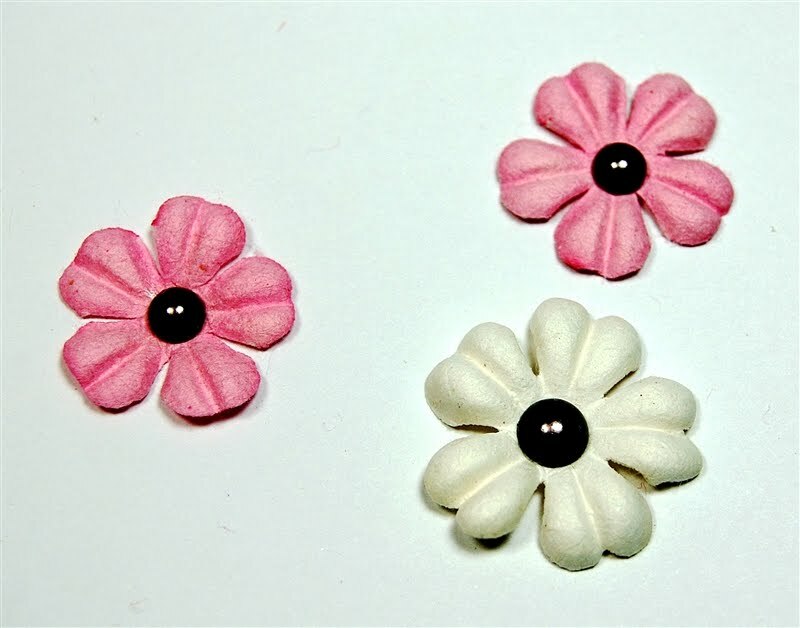 I decided to add some flowers to add an additional touch of pink. I used black pearls (also from Creative Charms) for the centers. 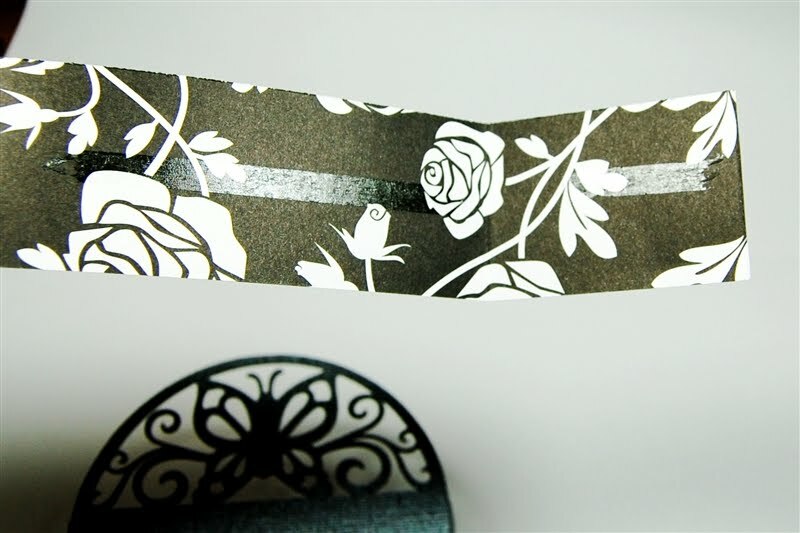 The Cricut hook tool is very useful for picking up glue dots and helps to place the flowers on the ribbon band. 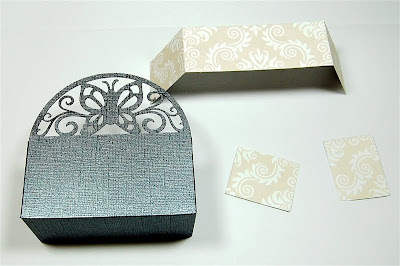 A name can be added to the top of the box on a simple tag or cardstock strip. 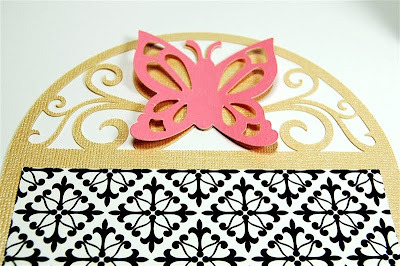 A table full of these elegant cut out butterflies would be a very pretty sight! Good Monday Morning! 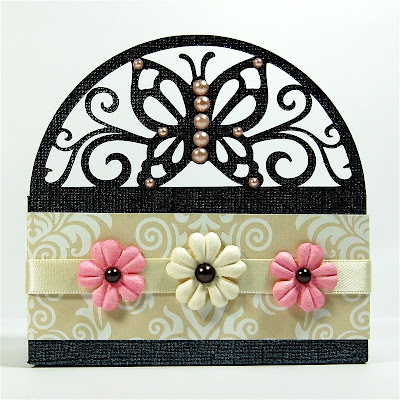 This is Diane and I am so happy to join you this week as Guest Designer. 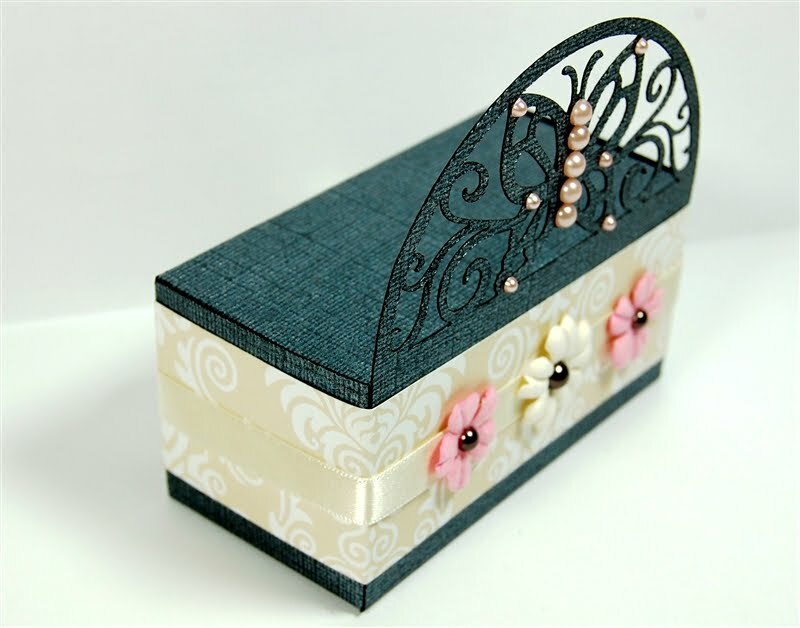 Some of you may know me already from my blog Capadia Designs. I am looking forward to getting to know many more of you. I want to thank Joy and Melanie again for asking me to share some of my designs and projects this week. I also want to thank all of you for the very warm welcome you have given me already in the comments on Joy's post introducing me! 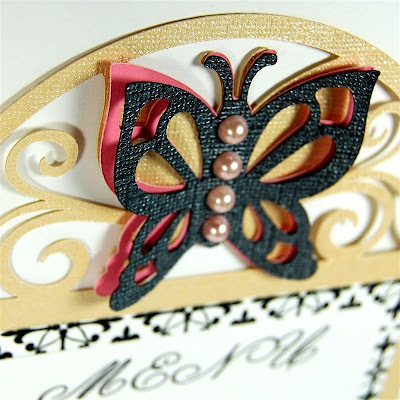 For this card I used various colors of "gemstone" cardstock by Core'dinations. 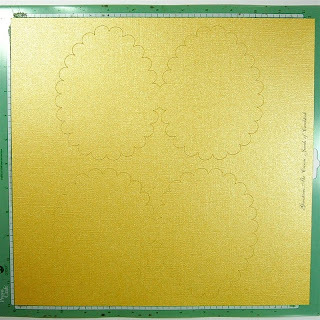 My local Joann's carries this cardstock and I watch for the sales when you can buy cardstock at a great price (often 5 for 99 cents) and stock up. 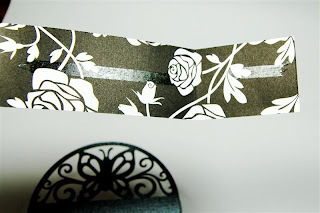 The cardstock has a lovely sheen and cuts beautifully in the Cricut. 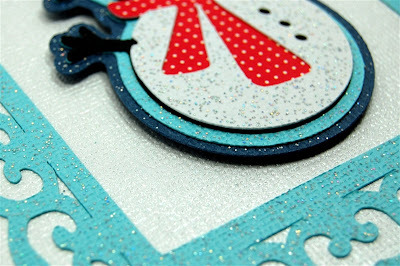 The "right" side of the cardstock is textured and shiny - the reverse side is a smooth vibrant solid. You can see both sides in this photo. I kept the cards very simple to show off the lovely cardstock. If you want to "dress it up" a bit you could add some gems or Stickles glitter glue. 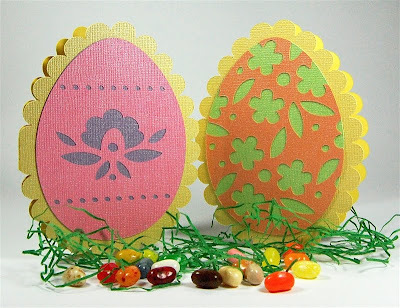 I adhered the decorative layers to the solid eggs using my Creative Memories Precision Point Adhesive. This is my favorite adhesive for small or intricate cuts. 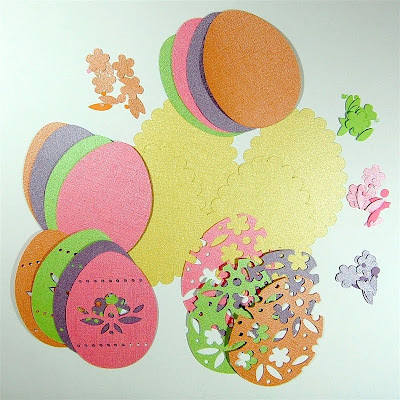 I am a Creative Memories consultant and keep active so I can satisfy my addiction to this adhesive, the tools, the digital scrapbooking program, StoryBook Creator Plus 3.0 and wonderful digital content. 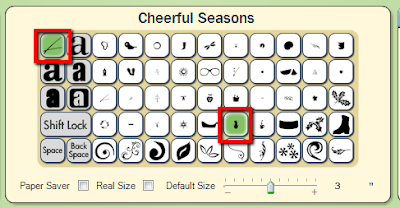 If you are not familiar with Design Studio or find it difficult to use, I am happy to do whatever I can to help you. There are many tutorials on my blog and I do my best to answer all of the Design Studio questions I receive from readers. I also share my .cut files so that you can download them and see how I put things together - or simply cut the projects I have designed. I like my shaped cards to be able to stand up on their own - this card will stand nicely since the two lowest scallops are nearly even. 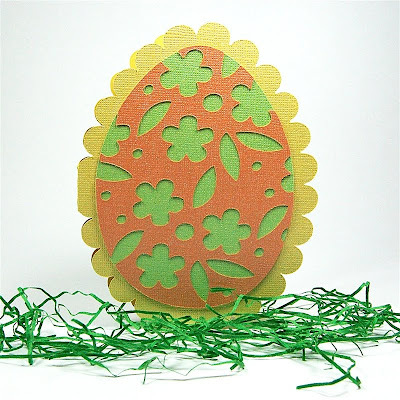 I cut eggs in a lot of different colors so I could make several variations of the card and use some of the "extra" eggs for other projects. I always try to make the most of my paper by planning out my cuts and saving the "leftovers" to use later. 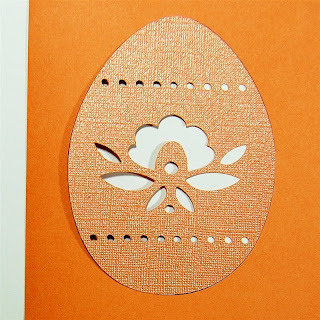 The .cut file for this card is available on my blog. 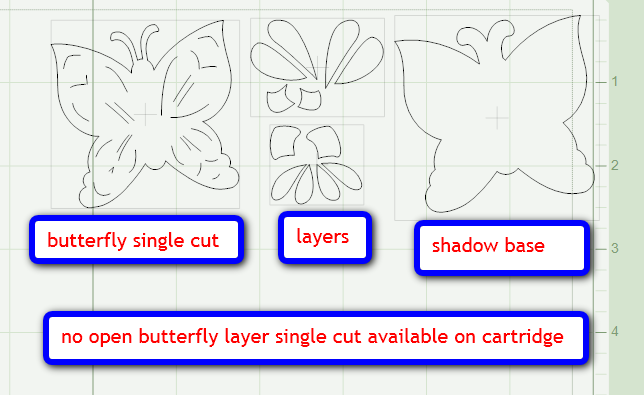 There is also another video in which I give a "guided tour" of the actual cut file and explain a few things about how I use the program to help me make the best use of my paper. Here is the LINK to my blog post. 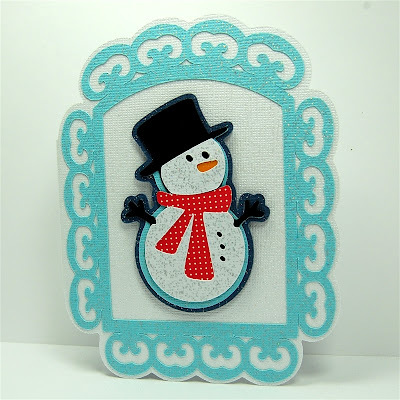 This card is made with a combination of elements from the two Creative Memories exclusive cartridges, Reminisce Accents and Cheerful Seasons. I created the shaped card and frame from elements on the Reminisce Accents and the snowman is from Cheerful Seasons. 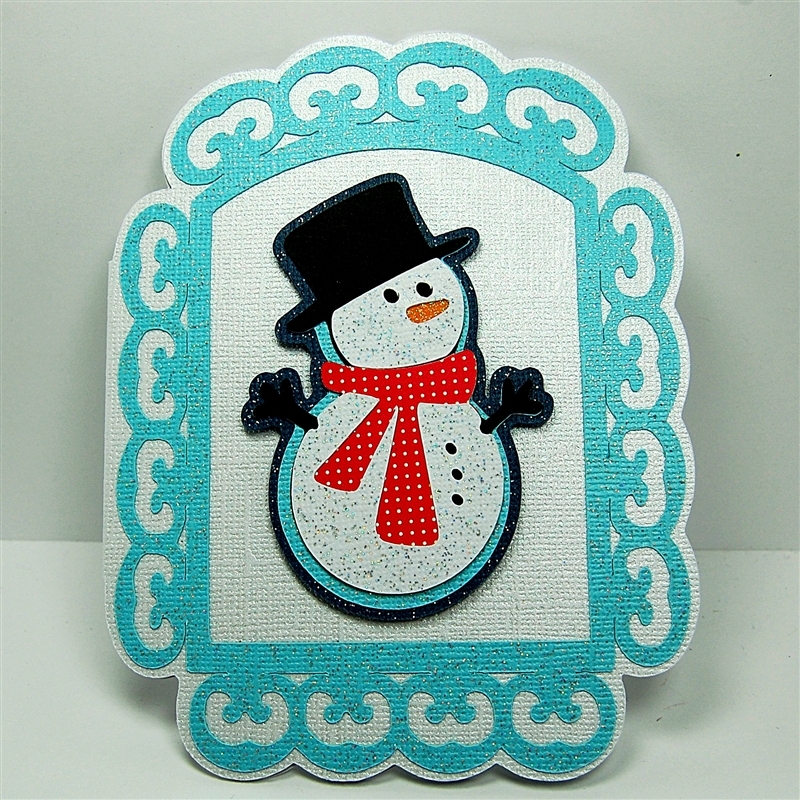 Today I want to show you how I changed the snowman by adding an extra layer and tomorrow I'll explain how to create the card base and post the file. 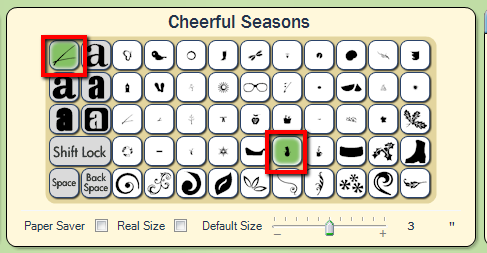 Cheerful Seasons is primarily a font cartridge with five of the seven possible functions nearly filled with alphabets. This leaves four settings for the shapes and their layers. When you cut the layers exactly as they are set up on the cartridge you will have these four cuts to use to build the snowman. 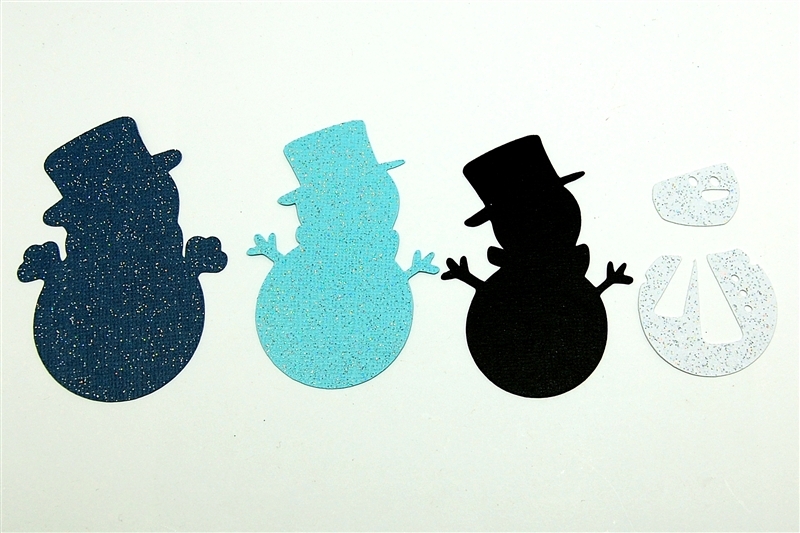 The result is a snowman with all of his details in a single color - in this case black. I wanted to add a few more colors so I decided to cut a few extra pieces. I wanted my snowman to have a red scarf so I cut an extra of the third layer (shown on the keypad above). Now I had a piece to use to create the scarf. The red dotted cardstock is from Martha Stewart. 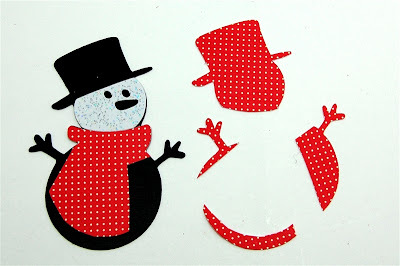 I only wanted the areas that would form the scarf to be red so I trimmed away these extra pieces. 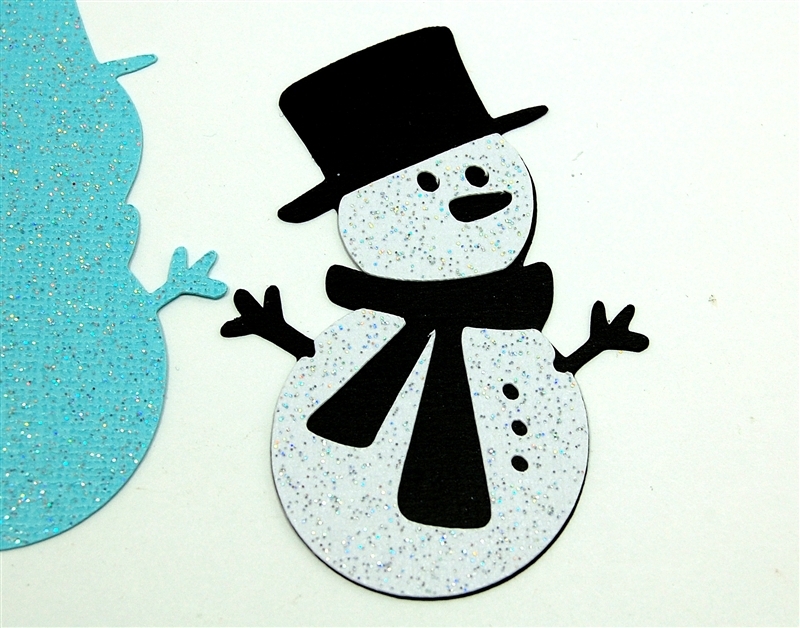 I also wanted my snowman to have a carrot nose so I found a tiny scrap in orange glitter cardstock that was left from another project to fit behind the nose cut on the face. When you put the layers together, the shadows work a little bit differently. The layer beneath the snow layer only extends beyond the "snowy" parts. 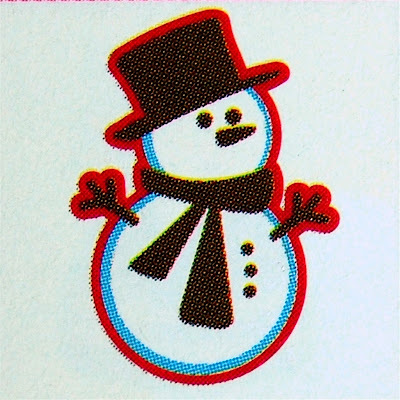 It lines up exactly with the arms and hat. 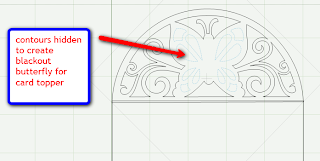 This image from the handbook shows you how to align the pieces. I used Core'dinations gemstone cardstock for the card base and core couture glitter cardstock for the frame, and three of the layers of the snowman. The black layer is actually the back side of a piece of Onyx gemstone cardstock because I wanted the matte effect with so much shine going on in the card. 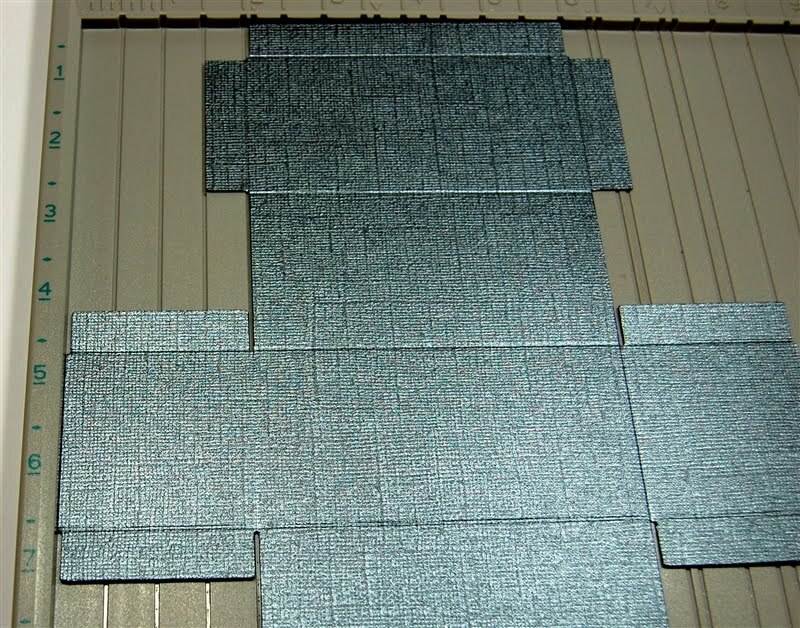 It is extremely difficult to photograph the Core Couture cardstock and truly capture the sparkle. 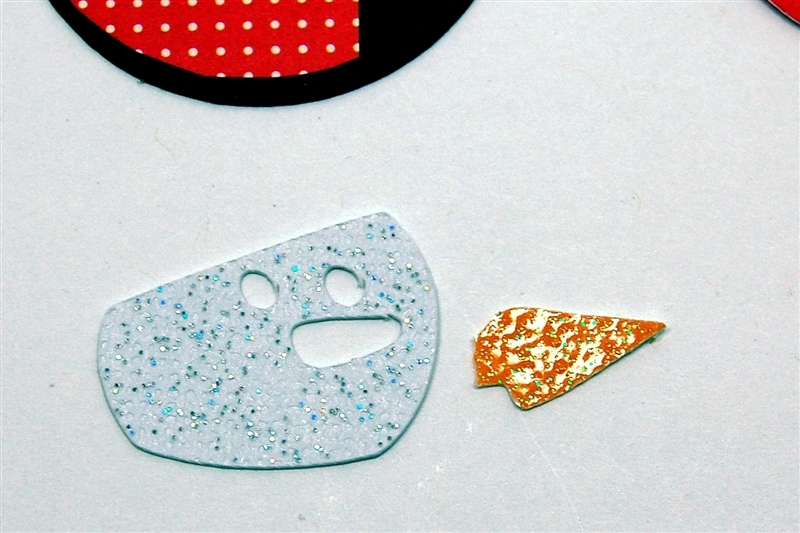 It is a delicate and almost iridescent glitter finish and is extremely pretty in person. 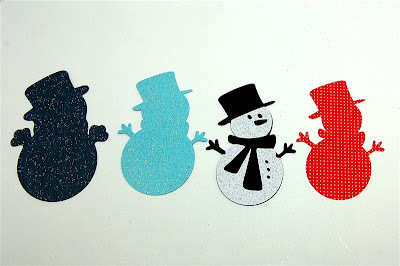 I find this cardstock at Joann's and try to wait for the sales to stock up. 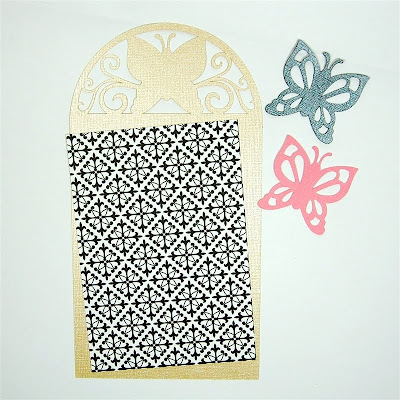 It also cuts very nicely in the Cricut - the frame has a lot of twists and turns and some small triangular areas and it cut perfectly and lifted right off the mat. I have many more projects which are labeled "PR-Core'dinations" in the right side column if you'd like to see more. There are probably even more if you search the blog for "Core'dinations" with the search box at the top left - I have not finished with the relabeling process I started a while ago. I'd love to serve on this Design Team and experiment with more of the product line. I will be traveling for the next few days but I'll do my best to keep up with email. I am still trying to catch up on the comments on the Capadia Designs Facebook page with the answers to the week of questions. The three boxes are on their way to two ladies in Georgia and one in Oklahoma - I wish I could be there to see them open their presents! What awesome projects. 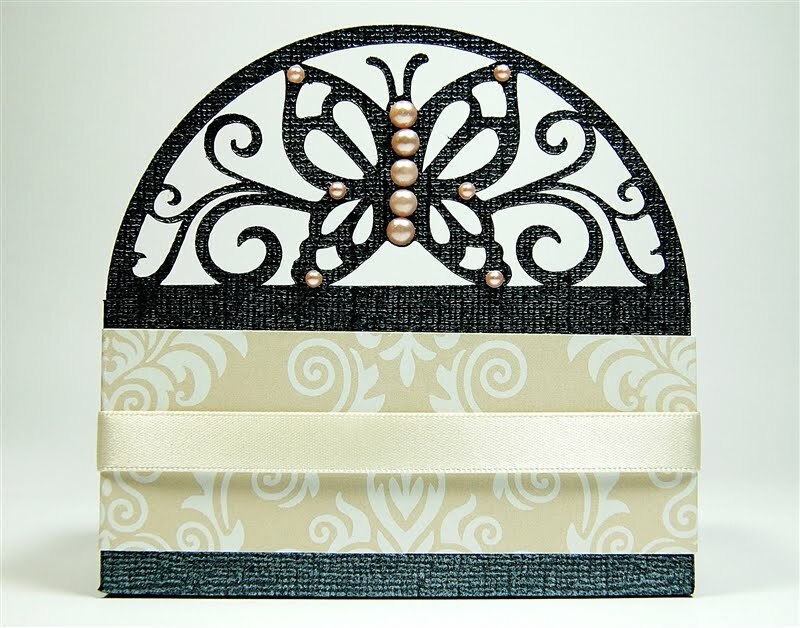 I love the Gemstone cardstock. 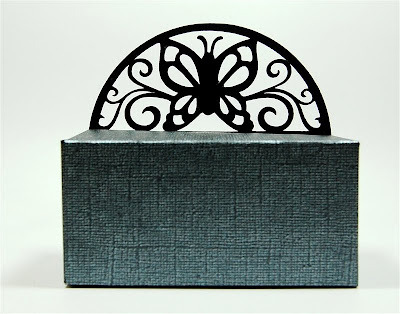 They have it on sale right now at Joann's (5 for $.95) and I bought some this week. 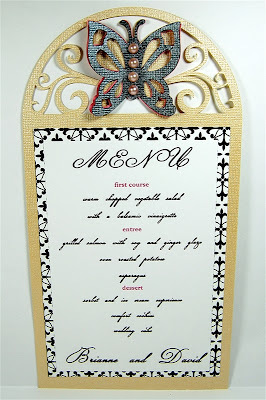 I really like the butterfly you put on the menu and box. 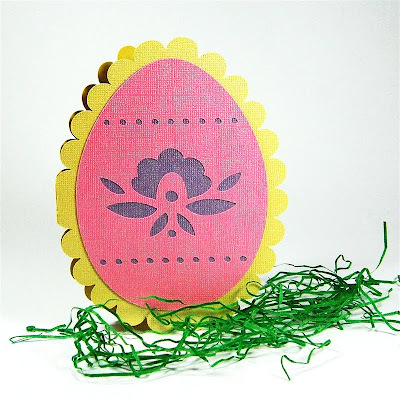 The Easter cards are so cute and the lacy layers really work so well for them. Thanks so much for sharing. 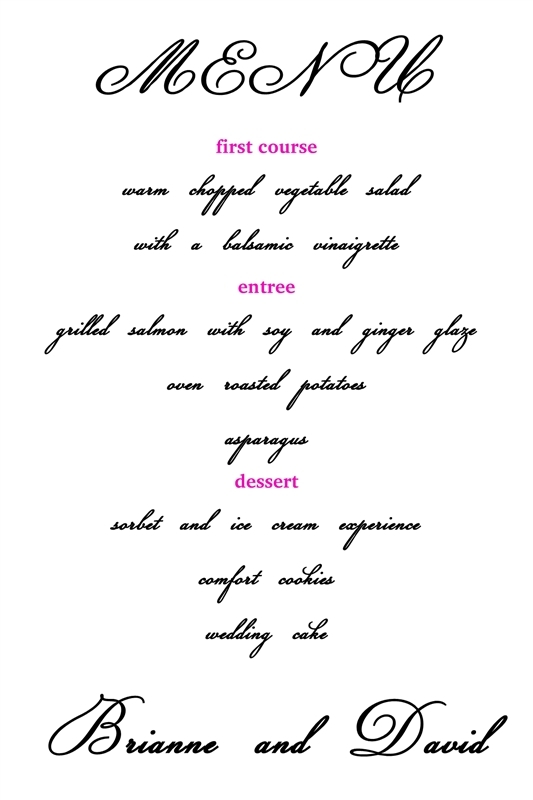 Love what you did with the menu!!! Love Core'dinations paper but is so difficult to get in my area. All of the projects are awesome. I have use this paper and it is wonderful to work with. I hope you are chosen for the design team. They will be so lucky to have you. I hope you have a safe journey and if you pass through Linden, NJ honk the horn. I think your projects are beautiful. Hope you make the design team. I use a lot of these papers also. Thanks for sharing and good luck and good weekend. 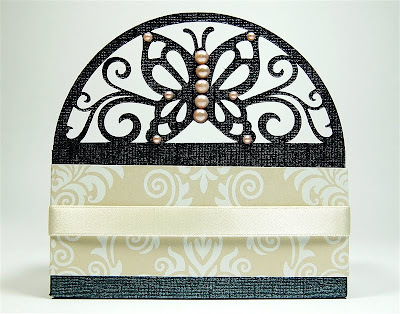 Good Luck Diane - Those are beautiful projects and represent the beautiful creations that can be made with coordinations. Thanks, Diane. I remember seeing these projects before and I really appreciate all the information about DS as I've just downloaded the trial version to play with before I purchase the regular version! I was already able to weld some basic shapes together to create my friend's wedding invitation bases! Oh, and good luck with the design team call! Well, if they don't pick you they may as well just close up shop & go home. These are all great projects, as yours always are. I have GOT to sit down one day and go back thru your older posts to see what all I missed before I started following. Oh my goodness I love all the projects. The wedding one is amazing. Beautiful projects! 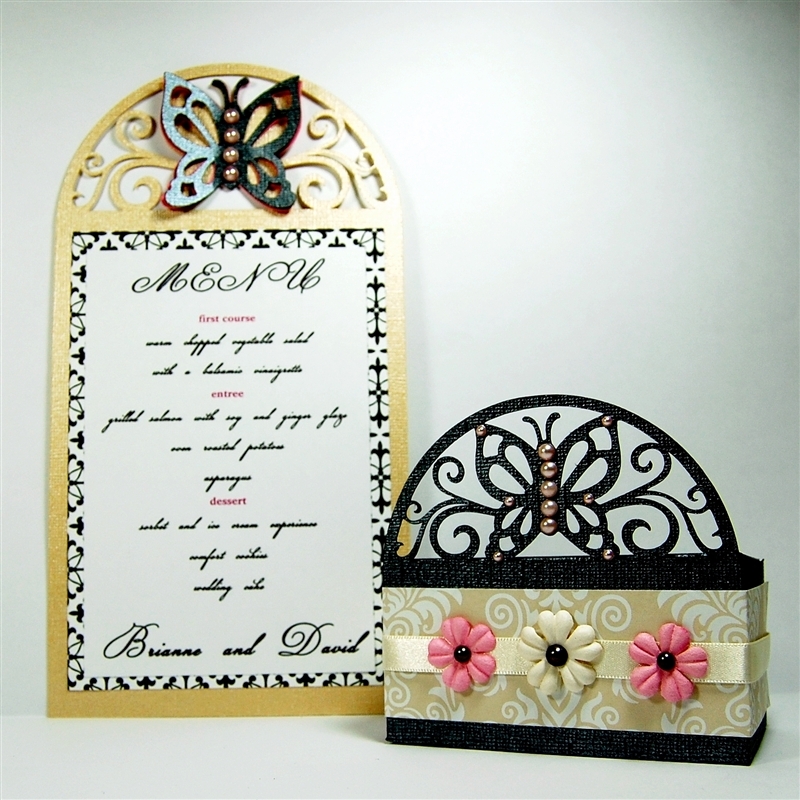 Love the butterfly box with all the details. If they don't pick you, they are crazy! 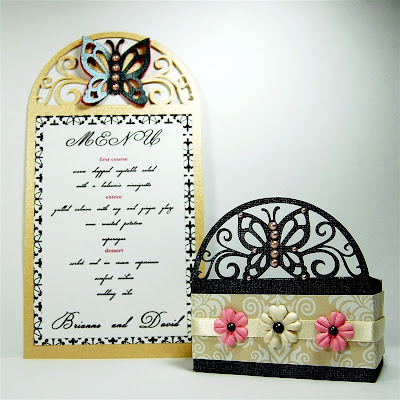 The wedding card is absolutely stunning. I would love to see a video of the invitation. It's so much easier for me to catch on to something when I am shown step by step. what is the overall size of the invite. It's fun looking back at projects. 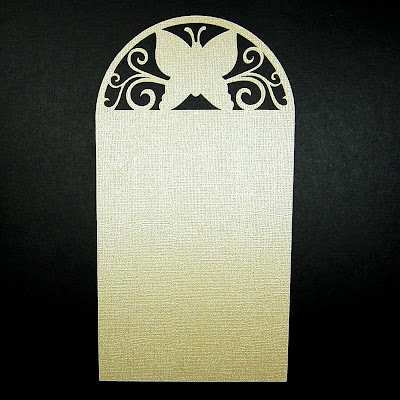 I still think that wedding project is so nice and elegant. You would, of course, be great for their design team. Thanks for sharing. Good luck getting on the dt Diane! You are a great representative for Core'dinations already & they'd be lucky to have you. These are fabulous projects. I first learned about the gemstone paper from your blog & you do such beautiful things with it. I also learned from you that they have it at J's & I can get it when their paper is on sale. I love the wedding project. I did not see it before, but I did see the Easter egg card. Great work. Thanks for sharing. I remember these projects. 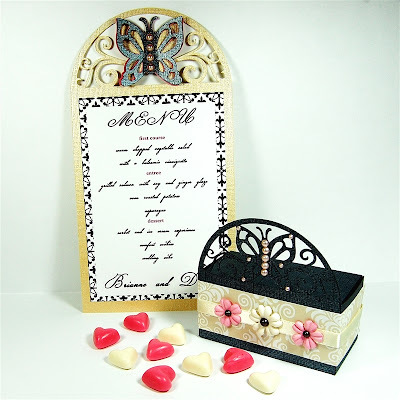 The menu card and box are fabulous. Great work on them all. Enjoy your trip. Oh, I so remember the first two projects...just stunning! Good luck with the DT call. :-) I haven't tried their cs yet...not sure what I'm waiting for!! 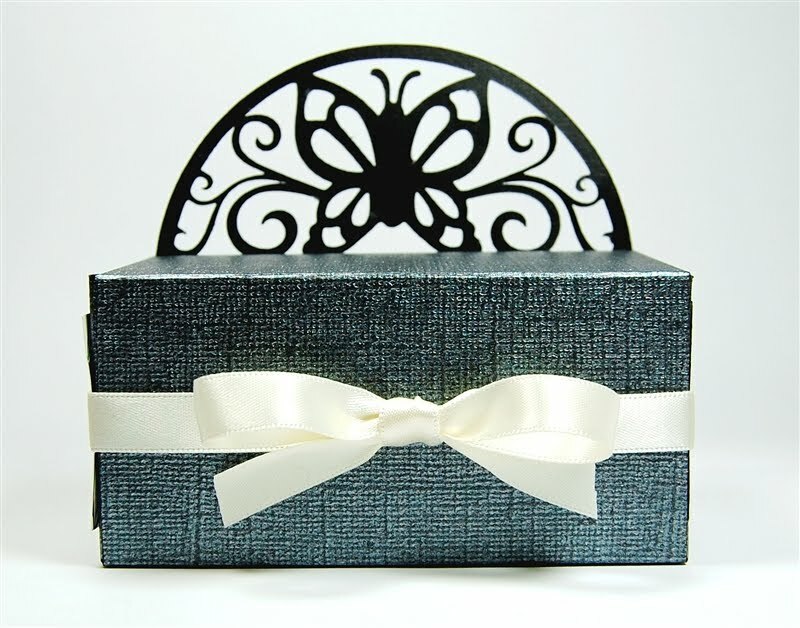 All of these projects are awesome and I really like the treat box. Coordinations papers are so fun. I love it when JoAnns puts them on sale. I just got the CM Storybook3 program so am excited to see what you have done. Another project added to my long list of things to learn. Beautiful projects Diane. Best of luck with getting on the design team. Hope you make it! Thanks for re-posting these...they are some of my all-time favorites!